Best Air Conditioner for Classrooms • The Air Geeks, reviews of air conditioners, dehumidifiers and air purifiers. Our stance on the best classroom air conditioner? How does a portable air conditioner for classroom work? How energy efficient is a portable air conditioner for classroom? How convenient are portable air conditioners for classrooms? How do I determine the right size of a portable air conditioner? Which additional features can a portable air conditioner for classroom offer? How many mobile units do I need to condition one classroom? Can I use a single portable AC for many classrooms? What do I require to set up a portable air conditioner? Is a portable air conditioner for classroom noisy? What are the effects of selecting an air conditioner that is too small for my room? What effect does a portable air conditioner for classroom have on relative humidity? Can I lengthen the hose of my portable air conditioner? Why? This silent and efficient classroom air conditioner uses ice and water to cool a large space so you can actually be too cool for school. A+! Wanna be too cool for school? Read below! These mobile units use Freon to cool warm air that is then fanned back to the room. 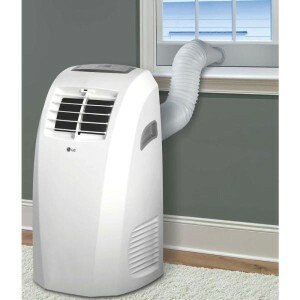 A portable AC uses a flexible hose to vent the warm air from the room where it is installed. In standard settings, portable air conditioners exhaust hot air directly to the outdoors. In other cases, the units can vent hot air above a drop ceiling, in an attic or to another room. During the cooling process, PACs trap humidity which undergoes condensation. In most units, the condensed moisture is channeled to a reservoir. You can drain the collected water manually or you can use the continuous drainage mode that is supported by most units. Some portable ACs can automatically evaporate the condensed water together with hot air. The power consumption of a portable AC depends on the conditions of the space, design of the unit, and its capacity. When the room temperatures are extremely high, these units consume a lot of energy as they struggle to achieve the target temperature. The units also consume more power if they run for longer hours, for example, twenty hours a day. For models that deliver high capacity, e.g 14,000 BTU, power consumption is quite high and may at times require special wiring or outlets. The ease of moving these units from one position to another makes them an attractive choice. You can wheel the air conditioner from one classroom to another or from one part of a classroom to another with ease. If there is a permanent air cooling solution that fails to cover certain areas, then a portable unit can complement it. The mobile air conditioners are also convenient as they can cover those sections that cannot accommodate permanent installations. 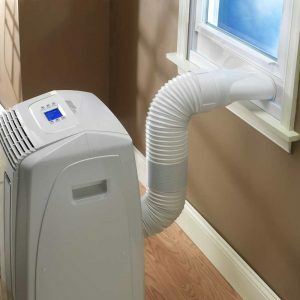 Some of the factors to consider when selecting a portable air conditioner for classroom include insulation of the room, number of occupants, and the number of windows. You also need to consider the BTU rating of the cooling solution that you are intending to buy. For classrooms that are 350 to 450 square feet in size, experts recommend a 12,000 BTU unit. A bigger space, for example, 550 square feet, demands a 14,000 to 16,000 BTU cooling solution. 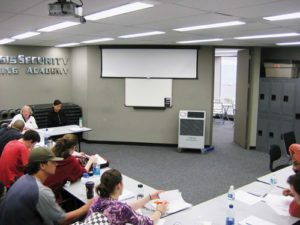 When selecting a portable AC for classroom, it is necessary to select a unit that has all the features that you need. Some of the features that are not available in all models include built-in dehumidifier, built-in heater, and built-in purifier functions. The built-in dehumidifiers capture excess moisture from the air. Built-in heaters are used for heating the space when the temperatures are low. The built-in air purification function enables portable units to capture some airborne pollutants. Other features that you should consider include adjustable thermostat, programmable timer, controls, et cetera. The number of units required mainly depends on the size of the space and ventilation. In most cases, a single high capacity cooling solution will be enough to cool a large classroom. A portable air conditioner is designed to cool the air in its immediate environment. The cooling effect can only be felt in the adjacent room if there are openings between the two rooms. Most portable air cooling solutions come with an easy to install window venting kit. With a manual, it is easy to install a portable air conditioning unit. You should select a suitable position for your unit in order to ensure that there are no blockages to air circulation. You should also consider the distance of the selected position from a power socket and a window or another opening. Once you have identified a suitable position, you should set up the unit and test it to ensure that it is running as expected. 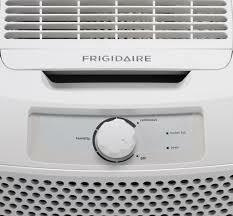 Air conditioners, just like other appliances that have moving parts, produce sound. To determine the degree of noise, manufacturers use decibel rating; abbreviated as dB. Most portable air conditioners produce between 48 and 60 dBs of noise. If you have low tolerance to noise, then you should select a whisper quiet air conditioner. Alternatively, you can minimize noise produced by a portable air conditioner by ensuring that it operates in the lowest speed mode. Portable units that produce irritating sounds are unsuitable for quiet environments. Undersized units always overwork to achieve and maintain the target temperature. This causes water to freeze on the cold cooling coils. As a result, the airflow within the portable AC reduces thereby lowering the overall efficiency of the cooling solution. To get the desired cooling, the specifications of the unit should match with the dimensions of your classroom. Most air conditioners are capable of capturing excess moisture from the air. Just like on a cold glass window, this moisture condenses on the cooling fans. 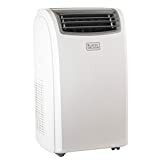 In high humidity environments, the built-in dehumidifier of a portable air conditioner for classroom can capture a lot of water within a short time. The reservoir should be emptied on regular basis to prevent spillages or automatic shut-offs. The collected water can also be drained under gravity or pumped to an external sink. Most portable air conditioners don’t have a built-in pumping mechanism. Extending the tube can lead to overheating of the unit. Overheating lowers the overall efficiency of a portable AC. In extreme cases, an extension may violate the warranty granted by the manufacturer.